To climb Pacaya, you must have a guide from the National Park office in San Francisco de Sales, a village partway up the volcano. Be warned! The villagers look to climbers for income. Village boys try to sell you walking sticks and the men try to rent you a horse, neither of which you need if you’re even moderately fit. If you do take a ‘taxi,’ the cost is pretty reasonable at just a few dollars. And don’t worry about the horses. They’re friendly, docile, and gentle. As you climb, the path becomes soft and loose, like black dusty sand. It makes for hard walking but there’s a rest stop around halfway — with more villagers selling water and fruit. Higher up, the trees thin and you’ll often see and hear the line of volcanoes along the opposite valley erupting. Far below, small towns cluster in the valley bottom and to the left is Caldera Lake. The lake is the highest of its kind in Guatemala (according to Chico, our guide), and good for fishing and boating but not for swimming — it’s too cold. After the forest come steep meadows of thin grass and cultivated fields, though the principal crops of coffee and avocado are on hillsides away from the volcano. With nothing now hiding it, Pacaya’s cone dominates the skyline. Its black presence, with a fresh dark scar running down from the cone (left by an eruption only six weeks before our visit), it looks like Mount Doom in Lord of the Rings. After climbing so far, it’s almost a relief to find you have to go downhill a little to reach the lava field. Going down the loose powder needs care, however, because your feet slide out from under you at each step. The lava field is hot to the touch, with a faint smell of brimstone on the cool air. 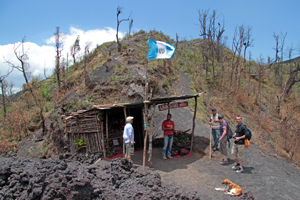 A well-marked, uneven path leads across the lava toward a small hut with a large Guatemalan flag — the Lava Shop. As you approach the Lava Shop, which sells gifts made from Pacaya lava, the owner’s friendly dog will likely come to lead you to the shop. Considering I could feel the lava’s heat through my stout shoes, I was impressed by the animal’s fortitude. And considering you’re buying from a shop perched on an active volcano, the souvenirs are reasonably priced. While the visitors do their shopping, the guide begins toasting marshmallows over one of the hot lava vents. After somewhat hesitant tasting, we took over toasting duties ourselves using forks made of dry sticks from the dead bushes nearby. The heat from the vents toasts the marshmallows quickly and, apart from a slight sulfur taste, they’re like marshmallows toasted anywhere. After descending across older, more powdery lava that shifts underfoot, the walk down the volcano is easier than climbing up. The track is wider and for the most part not so steep. We took another break at one of Pacaya’s ‘interesting’ restrooms and more of our party now took a ‘taxi.’ With our backs to the cone and our eyes on the valley far below, there’s an anticlimactic end-of-the-trip feel to this part, but it’s still another 45 minutes’ walking to get down to the village, which makes the horse ride attractive. Many web travel companies offer trips to Pacaya, as do cruise lines if you’re arriving in Guatemala that way. If you’re already in Guatemala, visitor centers in Antigua and other cities sell tickets. 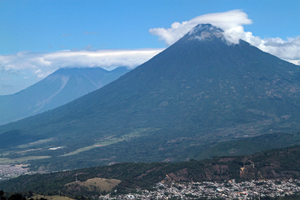 For more information, visit http://www.visitguatemala.com/en.